A regular breeding resident and migrant, the Lark Sparrow was an uncommon species during the Minnesota Breeding Bird Atlas (MNBBA). The Lark Sparrow is primarily a species of the western United States, with populations spread across the Great Plains and west to eastern Washington, Oregon, and the California coast, where the species is a year-round resident. Small numbers breed in the southern Prairie Parklands of central Canada and occasionally as far east as Ohio and eastern Tennessee. Year-round populations also occur in Texas and northern Mexico. The species reaches its highest breeding densities in the Great Plains, from Montana south through Texas (Figure 1). A short- to medium-distance migrant that winters primarily from Texas south through Mexico and portions of Central America. A ground-foraging omnivore that feeds primarily on seeds and arthropods. Even during the breeding season birds are frequently seen foraging in small flocks. An open-cup nest, often placed in a small depression on the ground, frequently located at the base of a small forb or woody plant. Occasionally placed in trees or shrubs less than 4 m high. May reuse its nests or those of other species. Breeding distribution and relative abundance of the Lark Sparrow in North America based on the federal Breeding Bird Survey, 2011–2015 (Sauer et al. 2017). In the late 1800s and early 1900s, Roberts (1932) described the Lark Sparrow as a summer resident in the southern and western regions of Minnesota south of the Laurentian Mixed Forest Province. It was most common in southeastern Minnesota, gradually decreasing in abundance further north through the Red River valley. Confirmed nesting records (nests with eggs) were available from Goodhue, Hennepin, Marshall, and Sherburne Counties; inferred nesting reports (fledglings or adults carrying food) were available from Isanti and Norman Counties. … unfortunately it is one of the birds that has suffered the greatest diminution in numbers during the last score or so of years. The explanation of this decrease is not evident, but the fact remains that there is not one pair today where there were many twenty-five or thirty years ago. The rapid loss of the species’ preferred savanna-like habitat was the most likely cause for the decline. Hibbard commented on the distribution and abundance of many grassland sparrows in Minnesota and North Dakota, including the Lark Sparrow (Hibbard 1965). Lamenting that much of the suitable sandy savanna habitat where the species was found in Sherburne County was being rapidly converted to pine plantations, he urged that the few remaining prairie sites in the Sand Dunes State Forest be protected from such actions. Ten years later, Green and Janssen (1975) described the Lark Sparrow’s distribution as largely confined to southeastern and east-central Minnesota, as well as the far northwestern corner of the state. Although there were scattered summer reports from west-central and southwestern Minnesota, including Renville and Jackson Counties, these regions lacked breeding records. Indeed, the compiler of the 1975 summer seasonal report, Kim Eckert, commented that the “the range of this species continues to defy description,” as he tried to reconcile just four seasonal reports from widely scattered counties (Eckert 1976). A few years later, Janssen (1987) delineated four “somewhat separate” breeding areas for the Lark Sparrow: (1) southeastern Minnesota, (2) east-central and central Minnesota north to Washington and Sherburne Counties, (3) the Minnesota River valley west to Chippewa and Yellow Medicine Counties, and (4) northwestern Minnesota from Clay County north to the Canadian border. He identified 8 counties where nesting had been confirmed since 1970: Anoka, Clay, Dakota, Houston, Le Sueur, Polk, Renville, and Wabasha. Hertzel and Janssen (1998) added Otter Tail and Yellow Medicine Counties to this list. The Minnesota Biological Survey has documented a total of 61 breeding season locations. The majority of records were found in the same regions identified by Janssen (1987). A few records, however, were found between what he delineated as the northwestern population and the east-central population, including records in Becker, Crow Wing, Otter Tail, and Pope Counties. One record was located in Faribault County in south-central Minnesota (Minnesota Department of Natural Resources 2016). During the MNBBA, participants reported a total of 265 Lark Sparrow records in 3.4% (159/4,738) of the surveyed atlas blocks and in 4.4% (103/2,337) of the priority blocks. Breeding evidence was documented in 53 atlas blocks (Figures 2 and 3; Table 1). The birds were observed in 51 of Minnesota’s 87 counties (5 blocks in the Minnesota River valley straddled 2 counties each) and were confirmed nesting in 24 counties (2 counties, Scott and Chippewa, were included because of blocks that crossed county lines). Seventeen of the counties were additions to the list published by Hertzel and Janssen in 1998. The Lark Sparrow was largely absent from the densely forested counties of northern Minnesota, with the exception of the sandy jack pine communities in the Brainerd Lakes region. There were two other notable exceptions: one observed record of a bird seen by several individuals in Duluth on July 21, 2012, and one observed record in northern Cook County, reported by Bob Russell on June 23, 2009. The latter record was particularly interesting: three singing males were reported along a section of the Old Gunflint Trail that was burned during the 2007 Ham Lake Fire. Russell, an excellent ornithologist, reported that the site consisted of 40 ha or more of deciduous shrubs and some coniferous growth, “ideal habitat” for the species despite being located nearly 150 miles north of its traditional breeding range in the state. He later noted that the spring of 2009 was a “big year for vagrant Lark Sparrows” in northern Minnesota and Wisconsin, the birds being reported at sites outside of their normal breeding range (Russell pers. comm.). Unfortunately, another excellent birder, Karl Bardon, visited the Gunflint Trail site two days later and could not relocate the birds. Because the Lark Sparrow is an uncommon breeder in southern Manitoba, Russell speculated that the Gunflint Trail birds may have originated from that breeding population. In addition to the population center in the Brainerd Lakes region, MNBBA records documented that Sherburne County, as well as habitats in adjacent Isanti and Anoka Counties, remained a stronghold for the species. All of these populations are located within two prominent ecological subsections (the Pine Moraines and Outwash Plains Subsection and the Anoka Sand Plain Subsection), characterized in large part by the prominence of sandy outwash plains. Dry prairies, oaks, and jack pines grow in open, savanna-like communities on these soils, which provide ideal habitat for the Lark Sparrow. Elsewhere, the birds were most common in Dakota and Goodhue Counties and along the entire length of the Minnesota River valley, where dry, sandy river terraces and granite outcrops provide ideal habitat. The gravel beach ridges of former Glacial Lake Agassiz in northwestern Minnesota, from Wilkin County north to Polk County, also provide suitable habitat for the species. When factors other than soils are examined to predict landcover suitability for the Lark Sparrow, including climate, habitat, and landscape context, the resulting model predicts that southeastern Minnesota provides the most extensive region of suitable habitat (Figure 4). Other important areas include the Minnesota River valley, the glacial Lake Agassiz beach ridges in northwestern Minnesota, the lower St. Croix River valley, and the Anoka Sandplain Subsection north of the Twin Cities. It is difficult to assess the degree to which the Lark Sparrow has changed in distribution and abundance in the past one hundred years. The few locations where Roberts (1932) specifically mentions population declines in his account, including the cities of Minneapolis and Red Wing and the bluffs of the Minnesota River valley, have largely been developed as the Twin Cities metropolitan area and smaller communities have expanded. Of these areas, only the Minnesota River valley still provides suitable habitat. It is unclear if Roberts simply witnessed localized declines due to habitat loss or if the declines were more widespread. Clearing of the eastern deciduous forest in the late 1800s and early 1900s favored the Lark Sparrow and enabled it to expand east. It wasn’t until the mid-1900s, when urbanization continued and agricultural practices intensified, that the species actually retreated from its initial eastward expansion (Martin and Parrish 2000). In western Wisconsin, the Lark Sparrow declined in abundance during the first half of the twentieth century along the lower Chippewa River. Today it remains localized in abundance and restricted to the west-central and southwestern regions of the state (Cutright et al. 2006). In Ohio, where state officials have classified the species as endangered, the species had become rare and localized by the 1960s and remains so today (Rodewald et al. 2016). In South Dakota, however, detections increased significantly between the state’s first and second atlas, with most of the increase occurring east of the Missouri River (Drilling et al. 2016). Breeding distribution of the Lark Sparrow in Minnesota based on the Breeding Bird Atlas (2009 – 2013). Summary statistics of observations by breeding status category for the Lark Sparrow in Minnesota based on all blocks (each 5 km x 5 km) surveyed during the Breeding Bird Atlas (2009-2013). Summary statistics for the Lark Sparrow observations by breeding status category for all blocks and priority blocks (each 5 km x 5 km) surveyed during the Minnesota Breeding Bird Atlas (2009-2013). Landcover suitability of the Lark Sparrow in Minnesota based on habitat, landscape context, and climate data gathered during the Minnesota Breeding Bird Atlas (2009-2013) using the MaxEnt modeling approach. 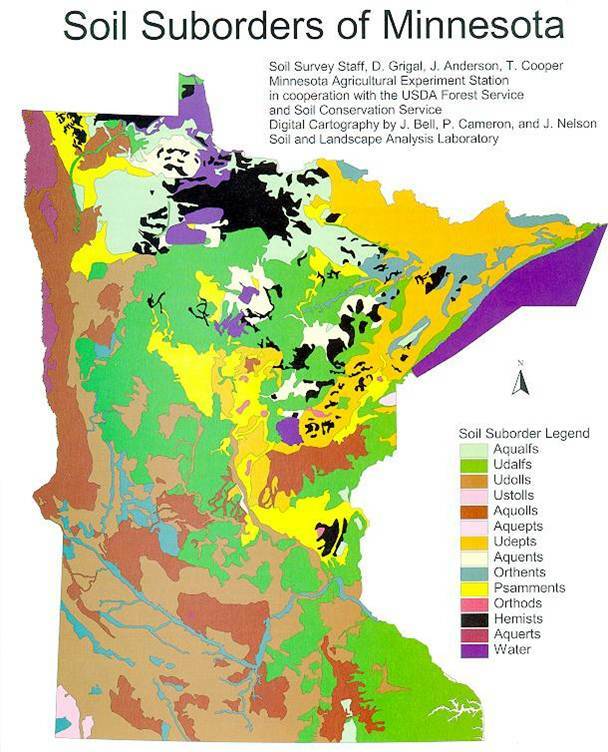 Soil classification for Minnesota (©MN Agricultural Experiment Station). Bright yellow depicts psamments, also known as sandy soils). An open-country species, the Lark Sparrow prefers structurally open habitats. In Minnesota, it is most frequently associated with oak savannas, dry grasslands, or pastures with small trees or shrubs scattered within or adjacent to open areas (Figure 5) (Martin and Parrish 2000). Sites with poor soils are ideal, as they provide the sparse ground cover and open bare areas that are used for foraging. Abundance decreases as the amount of ground litter and the density of cover increase (Dechant et al. 2002). Canopy cover of less than 24% is preferred (Martin and Parrish 2000). The Lark Sparrow is often characterized as an edge-dependent species. Sandy soils are common, but sites that are gravelly or heavily grazed also are used. As noted earlier, the local populations in east-central Minnesota are located on sandy outwash plains; the local populations along the upper Minnesota River valley, however, are located along the dry prairies and granite-gneiss outcrops that hug the river valley bluffs. Nonnative grasslands may be used, but the species has a preference for sites that are heavily grazed, with low, short cover and patches of bare ground. Conservation Reserve Program (CRP) lands are rarely used unless they are managed to provide some scattered trees and shrubs and some open areas with sparse ground cover. Studies have not investigated the species’ area requirements (Dechant et al. 2002). Typical breeding habitat of the Lark Sparrow in Minnesota (© Lee A. Pfannmuller). Monitoring data collected by the federal Breeding Bird Survey (BBS) were used to estimate the current size of the continental population of the Lark Sparrow at 10 million breeding adults (Rosenberg et al. 2016). In 2013, Minnesota was estimated to support only 1,700 individuals (Partners in Flight Science Committee 2013). No estimates of the Lark Sparrow’s population in Minnesota were attempted with MNBBA data because there were too few observations. Located on the northeastern periphery of the sparrow’s breeding range, the Lark Sparrow is rarely encountered along BBS routes in Minnesota. In the southern Great Plains, an average of 30 birds is detected per BBS route in Texas and an average of 44 birds is detected per route in Oklahoma (Sauer et al. 2017). Local nesting densities range from less than 1 pair per 40 ha in North Dakota to between 5 and 40 pairs per 40 ha in Montana (Martin and Parrish 2000). BBS data are too sparse in Minnesota to generate a statistically reliable population trend (Sauer et al. 2017), but across the BBS survey region populations have experienced a significant decline of 0.78% per year from 1966 to 2015 (Figure 6). The decline was steepest from approximately 1970 through 2000 and appears to be attaining a more stable trend in recent years. By contrast, in the Prairie Pothole Region, populations have experienced a significant increase of 3.25% per year (Sauer et al. 2017). The primary factor for the species’ decline is attributed to the wide-scale loss of suitable habitat in the eastern half of the United States. Areas that were cleared for agriculture are now succeeding to forest, converting to residential development, or being more intensively cultivated. Indeed, the average number of birds on BBS routes in the eastern BBS region, which encompasses all states east of the Mississippi River, has declined from a high of 3 birds in the early years of the survey to only 0.06 in recent years (Martin and Parrish 2000; Sauer et al. 2017). This loss has been minimized by the significant increases that are seen in the prairie and parkland regions, including southern Manitoba, the Dakotas, and Nebraska. 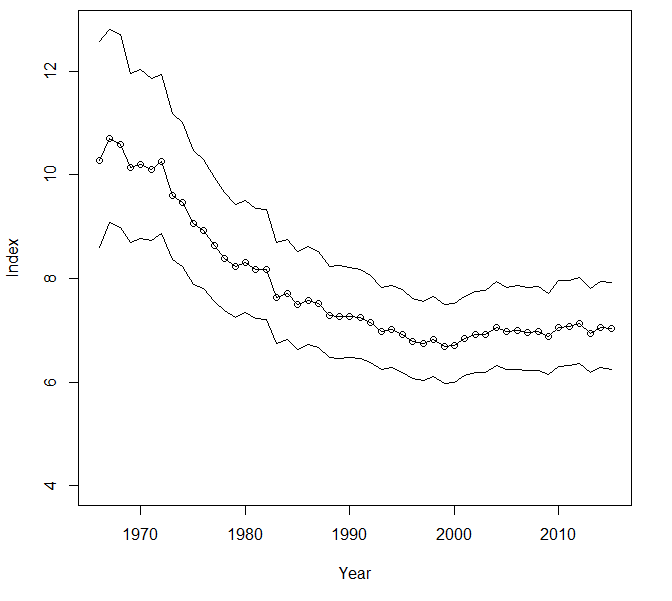 Farther west, population trends have been quite variable (Figure 7). Annual variations in precipitation may impact vegetation and insect abundance in the species’ favored shrub-steppe habitat in the Great Basin. Fire suppression reduces available habitat in some areas, encouraging dense growth of shrubs, while the frequent use of fire to control exotic weed species on western pasturelands removes woody vegetation (Martin and Parrish 2000). Breeding population trend for the Lark Sparrow in North America for 1966–2015 based on the federal Breeding Bird Survey (Sauer et al. 2017). Breeding Population Trend Map for the Lark Sparrow based on federal Breeding Bird Survey data, 1966-2015 (Sauer et al. 2017). Despite its population decline, threats to the long-term sustainability of the Lark Sparrow’s population are considered fairly low. Coupled with the overall size of the species’ population and its wide distribution, Partners in Flight has assigned it a moderate Continental Concern Score of 10/20 (Rosenberg et al. 2016). In Minnesota, the Lark Sparrow was officially classified as a Special Concern Species in 2013. Specific factors that led to its listing included a small population in the state, the declining number of new records by the Minnesota Biological Survey, the species’ patchy distribution, and its rather narrow habitat requirements (Minnesota Department of Natural Resources 2012). It also has been designated a Species in Greatest Conservation Need (Minnesota Department of Natural Resources 2015). Few specific management recommendations have been delineated for the species. Following an extensive review of the available literature, Dechant et al. ( 2002) recommended that grassland sites be burned at intervals of five to eight years early in the season, before the birds return to their breeding grounds. Burning at moderate temperatures helps to provide a matrix of unburned ground cover for nesting while still establishing more open areas with sparse cover for foraging. Because removal of woody vegetation is a common management practice on grasslands, retaining about 10% cover is critical for maintaining the Lark Sparrow’s population. The State of the Birds 2010 Report on Climate Change assessed the Lark Sparrow’s vulnerability to climate change as low (North American Bird Conservation Initiative 2010). More detailed analyses are lacking. At present, the Lark Sparrow remains an uncommon species with a relatively narrow habitat niche in Minnesota. Although many grassland dependent species have been the focus of intense studies, this edge-dependent species has been largely overlooked. But its distinctive plumage, the lyrical quality of its song, and its unique habitat requirements make it one of the most interesting members of the sparrow family in Minnesota. Hibbard, Edmund A. 1965. “Comments on the Distribution and Abundance of the Lark Bunting and other Prairie Fringillids in Minnesota and North Dakota.” Loon 37: 70–72.